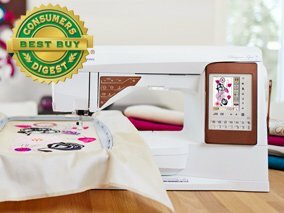 A modern sewing and embroidery machine with Interactive Color Touch Screen Design Positioning feature and built-in assistance. 1% Rotation - rotate designs 1% at a time to angle the designs just the way you want! Large Embroidery Area - 14 1/4" x 8"
Automatic Jump Stitch Trim - cuts top thread between areas for a cleaner finish! Bobbin Thread Sensor - the machine warns you when you are running low on bobbin thread BEFORE you run out!